The evil Marlowes are more determined than ever to steal the source of the Tinker family’s magic, and now they’ve been joined by some unlikely allies. In addition to worrying about protecting his family, Chase Tinker is learning that his relatives can be quite secretive. There isn’t much time for him to be angry about being kept in the dark, though, because the Tinkers need to stick together if they’re to stand against their enemy and rescue one of their own. Chase Tinker and the House of Secrets is a strong follow-up that certainly lives up to its name. We find out several surprising things about the Tinker family—and even a few about their old foes, the Marlowes—in this action-packed sequel that maintains the charm of the first book, Chase Tinker and the House of Magic, while also reflecting in tone the increasing maturity of its characters. Continuing character development is something that I look for in any sequel regardless of a book’s target age group, but I’m especially keen to see it in middle grade titles. The ones that tend to click with me as an adult reader feature characters who make me feel as though I’m watching them make a progressive journey into young adulthood. 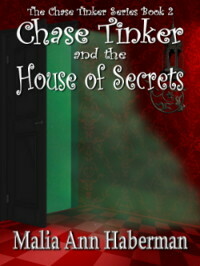 Chase Tinker and the House of Secrets does not disappoint in this area. Chase still acts impulsively at times, but he’s also more aware of the responsibilities he’ll shoulder one day as the Keeper of the Tinker’s magical house. He grows up quite a bit over the course of the novel, and by the end of it, he’s been thoroughly tested. Extreme circumstances force Chase to take some drastic action that leaves him shaken and guilt-ridden. It’ll be interesting to see how he copes with what happened as the series continues. Although this book delves into a little more serious territory than the last one, there’s still plenty of lighthearted stuff going on. Chase is more preoccupied than ever with not looking like a dork in front of Persephone, the housekeeper’s daughter. After very briefly becoming Keeper, Chase is able to use powers that once belonged to other Tinkers . . . every time he sneezes. This causes some distress for our young hero, of course, like being attacked by a garbage can in the school bathroom. There’s also an incident involving Nori, a newcomer to the series with a special connection to the Tinkers, and everyone in the room turning into goats. Moments like these made me laugh and reminded me why I still enjoy reading middle grade books. The titular house figures prominently in the story once again, but its amazing magic never eclipses the characters, which I really appreciated. You always know that the characters are the heart of the story; it just so happens that they live in this fantastic house where probably anything is possible. Returning to the Tinker house was a total thrill, and I loved the direction in which the series turned. This was another awesome adventure for Mr. Tinker and his family and friends. The intensity went up by just the perfect amount, and the magic was irresistibly enchanting once more. The Kindle edition of Chase Tinker and the House of Magic, the first book in the Chase Tinker series, is currently available from Amazon for only $0.99! Click here to buy a copy! One (1) winner will receive a $15 Amazon gift card and a bookmark signed by author Malia Ann Haberman! Winner will be notified by email and have 48 hours to respond or else another winner will be chosen. Giveaway ends at 11:59 P.M. EDT on July 22, 2013. To travel have the ability to transport to any spot in the world instantly! I'd love that, too! I've always wanted to travel all over the world, and that kind of ability would make it possible to go anywhere. I would love to have the power to heal others if I had a magical power..
That would be perfect! I wish that kind of power were possible! I have to agree with the transportation power. Then I could visit with relatives in Florida any time I wanted to. It would definitely make travel a lot easier, and, I'd hope, a lot less expensive! I know the feeling- I miss mine every day, and my dad, too. If I could have any magical power, it would be to fly like a bird. I would definitely want to fly. Something like Rogue from X-Men where I could steal others powers. Thanks for the giveaway!